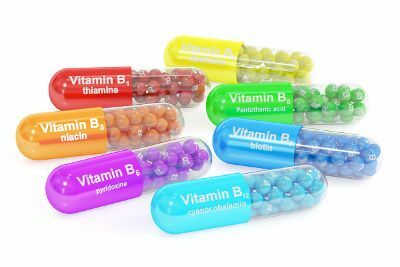 Hypervitaminosis B is a condition where there is too much vitamin B intake, especially in supplement form. As a result, too much vitamin B symptoms may include nerve toxicity, jaundice and liver toxicity, nausea, and digestive issues. Since B vitamins are water soluble, excess amounts will not build up in the body. Instead, they will be excreted through the urine. That being said, taking exceptionally high dosages of these B complex vitamins can lead to a variety of health risks and side effects. This article will detail the major side effects of too much vitamin B, including lung cancer in men and the effect of too much vitamin B6 while pregnant, as well as the specific health risks associated with too much vitamin B1, vitamin B2, vitamin B3, vitamin B5, vitamin B6, vitamin B9 (folic acid), and vitamin B12. What are some side effects associated with too much vitamin B? Among the health risks of a vitamin B overdose is an increased lung cancer risk in men. A study published in the Journal of Clinical Oncology in 2017 found that consumption of too much vitamin B6 and vitamin B12 could greatly increase the chance of developing lung cancer in men. For the study, Ohio State University Comprehensive Cancer Center researchers examined 77,000 patients between the ages of 50 and 76 over a 10-year period. It was found that the men taking high doses of vitamin B6 and vitamin B12 doubled their lung cancer risk. In men who were smokers, lung cancer risk increased by four times. At the same time, women taking the same amount of vitamin B did not see any increased risk of lung cancer. No link to lung cancer has been found in people taking regular doses of multivitamins. Other studies at the Ohio State University Comprehensive Cancer Center are underway to further examine high dose, long-term vitamin B6 and B12 supplementation and the risk of lung cancer. One of the studies will try to determine whether the increased risk of lung cancer can be replicated. The second study will examine the link in post-menopausal women to confirm the current finding of no elevated lung cancer risk in women. There are other too much vitamin B6 side effects. These can include too much vitamin B6 pregnancy-related problems. For instance, overdosing on vitamin B6 supplements can potentially cause nerve damage and birth defects in unborn children, as well as health risks for the mother. In the first trimester, taking over 100 milligrams (mg) of vitamin B6 can cause physical defects of the fetus’s legs and arms, and also nerve damage. Excessive vitamin B6 usage can also cause an addiction in the fetus to vitamin B6, which can cause withdrawal symptoms after birth. That being said, a study published in the Journal of Obstetrics and Gynaecology in 2006 concluded that higher than standard doses of vitamin B6 are not linked to an increased risk of major malformations during pregnancy, based on a small sample size of 192 pregnancies and an average vitamin B6 dosage of 132.3 mg per day. Furthermore, vitamin B6 is important during pregnancy since this vitamin can relieve morning sickness. A vitamin B6 deficiency can also lead to birth defects and prevent proper development of the fetal brain, which can lead to seizures after birth. The general recommended intake of vitamin B6 during pregnancy is around 1.9 mg daily, and 2 mg while breastfeeding. Consult with your doctor before beginning vitamin B6 supplementation while pregnant. Taking too much vitamin B is not without side effects and risks of health problems. For instance, some symptoms from taking too much vitamin B complex may include high blood sugar, blurry vision, numbness, nausea and vomiting, skin lesions, and liver problems. At the same time, some people experience gas, nausea, and diarrhea from taking normal doses of vitamin B. Others will experience an allergic reaction from taking too much vitamin B, including symptoms like swelling, hives, tingling, difficulty breathing, and excessive itching. Keep in mind, though, that fluorescent yellow urine is a harmless and normal side effect of taking vitamin B supplements. B vitamins may also interact with certain medications. That is why it is important to consult with a doctor before beginning vitamin B complex supplementation. This section will examine the side effects of too much of each B complex vitamin. Although rare, a vitamin B1 overdose can cause severe symptoms, such as a rapid and irregular heartbeat, low blood pressure, convulsions, and cardiac problems. Other symptoms may include shortness of breath and your lip color changing blue. Mild side effects of too much vitamin B1 will also include headaches, upset stomach, and general weakness. Certain medicines can also interact with vitamin B1, including loop diuretics, oral contraceptives, stavudine, and tricyclic antidepressants. How much vitamin B1 should you take? Vitamins and minerals in general are better absorbed when taken with a meal. Taking too much vitamin B2 is also rare, but there are side effects to consider of a riboflavin overdose. Too much vitamin B2 side effects include increased urine frequency, diarrhea, allergic reactions like hives, difficulty breathing, and swelling of the tongue or face. Vitamin B2 will also cause the harmless side effect of turning your urine to a yellow-orange color. Medication interactions associated with vitamin B2 include zidovudine (AZT), didanosine, doxorubicin, oral contraceptives, tetracycline, and tricyclic antidepressants. When you get vitamin B3 from food, an overdose is unlikely to occur. But, vitamin B3 supplementation is a different story. This can lead to possible side effects of too much vitamin B3, such as blurry vision, disorientation, nausea, vomiting, abdominal pain, bloating, nervousness, and headaches. It is also possible to experience a vitamin B3 side effect called a “niacin flush,” which produces symptoms like burning, itching, a tingling sensation in the chest and face, and severe skin flushing with dizziness. Liver damage, jaundice, and stomach ulcers may also occur from very high vitamin B3 doses. Also, avoid taking too much vitamin B3 if you have gout, ulcers, gallbladder disease, liver disease, diabetes, had a recent heart attack, or are pregnant. If you take vitamin B3 to lower cholesterol, be sure to do so under a doctor’s supervision. Medication interactions associated with vitamin B3 include atorvastatin, benztropine, carbidopa, levodopa, cerivastatin, fluvastatin, gemfibrozil, glimepiride, isoniazid, lovastatin, minocycline, oral contraceptives, pravastatin, repaglinide, rosuvastatin, simvastatin, tetracycline, thioridazine, and tricyclic antidepressants. Vitamin B5 and biotin (vitamin B7) are both needed for the metabolism and breakdown of carbohydrates and proteins. However, high amounts of vitamin B5 can lead to severe diarrhea. Toxic levels of vitamin B6 are known to cause various nerve or muscular problems. This includes too much vitamin B6 symptoms such as clumsiness, burning pains, loss of muscle coordination, paralysis, dyspnea, pain and numbness in the extremities, and rapid breathing. There may also be swelling of the lips, throat, and face, as well as reduced sensations of vibration, touch, and temperature. Other symptoms of too much vitamin B6 include oversensitivity to sunlight, skin rashes, appetite loss, nausea, vomiting, abdominal pain, and abnormal liver function. Medications that interact with vitamin B6 include anticonvulsants, carbidopa, levodopa, cycloserine, docetaxel, erythromycin, estrogens, fenofibrate, fluorouracil, gabapentin, gentamicin, hydralazine, hydroxychloroquine, isoniazid, mixed amphetamines, neomycin, oral contraceptives, oral corticosteroids, penicillamine, phenelzine, phenobarbital, risperidone, sulfamethoxazole, tetracycline, theophylline and aminophylline, tricyclic antidepressants, trimethoprim, and valproic acid. Vitamin B6 will also interact with folic acid (vitamin B9). Folic acid is thought to be very dangerous when taken in high doses. In normal circumstances, folic acid ensures a healthy pregnancy, supports nerve health, and protects against depression, cancer, and dementia. However, in high dosages, folic acid can cause great damage to your central nervous system. As a result, too much vitamin B9 symptoms will include irritability, insomnia, malaise, intestinal dysfunction, movement disorders, pain or numbness, seizures, skin reactions, and paralysis. Folic acid supplements can interact with certain medications like methotrexate and drugs that treat cancer and autoimmune diseases. Taking folic acid with antiepileptic drug used for psychiatric diseases or epilepsy may reduce the serum levels of these drugs. Folic acid also may reduce the effectiveness of the ulcerative colitis treatment sulfasalazine, and interact with zinc and vitamin B6. Vitamin B12 is an important vitamin for nerve function, DNA production, cell metabolism, and red blood cell formation. That being said, too much vitamin B12 side effects can include diarrhea, itching, blood clots, numbness in the extremities, and severe allergic reactions. Excessive vitamin B12 may also increase the risk of prostate cancer. Some medications that may interact with vitamin B12 include anticonvulsants, aspirin, zidovudine (AZT), cimetidine, clofibrate, colchicine, cycloserine, erythromycin, famotidine, fenofibrate, gabapentin, gentamicin, isoniazid, lansoprazole, metformin, methyldopa, neomycin, nitrous oxide, nizatidine, omeprazole, oral contraceptives, phenobarbital, ranitidine, sulfamethoxazole, tetracycline, tricyclic antidepressants, trimethoprim, and valproic acid. Vitamins and minerals are very important for the health of the body. That being said, as explained throughout this article, too much vitamin B is not without its share of problems. In general, taking your recommended dose of vitamin B complex is not likely to cause toxicity. However, make sure you follow the guidelines on the supplement bottle, and do not exceed the recommended dosage. It is also wise to be careful when combining other supplements with B vitamins. To avoid an overdose of B vitamins, always consult with your doctor or natural health practitioner before taking a higher dose than what is labeled on the bottle. Your health provider will also help you choose vitamin B supplements that fit your health concerns or needs. Calcium vs. Vitamin D: What’s Better for Healthy Bones? Brasky, T., et al., “Long-Term, Supplemental, One-Carbon Metabolism-Related Vitamin B Use in Relation to Lung Cancer Risk in the Vitamins and Lifestyle (VITAL) Cohort,” Journal of Clinical Oncology, doi: 10.1200/JCO.2017.72.7735, last accessed Jan. 24, 2018. McAllister, J., “Will Too Much Vitamin B6 Causes Birth Defects?” Livestrong, last updated Aug. 14, 2017; https://www.livestrong.com/article/492923-will-too-much-vitamin-b-6-cause-birth-defects/, last accessed Jan. 24, 2018. Shrim, A., et al., “Pregnancy outcome following use of large doses of vitamin B6 in the first trimester,” Journal of Obstetrics and Gynaecology, November 2006; 26(8): 749-751, doi: 10.1080/01443610600955826 , last accessed Jan. 24, 2018. Mateljan, G., The World’s Healthiest Foods: Essential Guide for the healthiest way of eating (Seattle: George Mateljan Foundation), 756-757, 768-769, 772-773, 786-793. Gaby, A.R., A – Z Guide to Drug-Herb-Vitamin Interactions (New York: Crown Publishing Group, 2006), 313-314. Pritchard, J., “B Vitamin Overdose Symptoms,” Livestrong; https://www.livestrong.com/article/404634-b-vitamin-overdose-symptoms/, last updated Oct. 3, 2017, last accessed Jan. 24, 2018. Wickman, G., “Vitamin Overdose,” Health Guidance for Better Health; http://www.healthguidance.org/entry/15616/1/Vitamin-Overdose.html, last accessed Jan. 24, 2018.